After months of community protest, pressure, and shaming politicians, it was announced that the North Side Housing and Supportive Services Shelter on Lawrence Avenue will be saved from closure previously slated Christmas weekend. 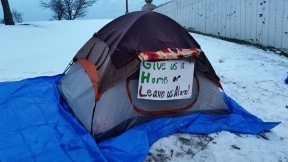 A rally took place to celebrate the victory at Lake Shore Drive Wilson Avenue, but also vocalize much more needs to be done to help the homeless community. “We are here to celebrate a victory, a victory of keeping open the Uptown shelter at 941 W. Lawrence Avenue. 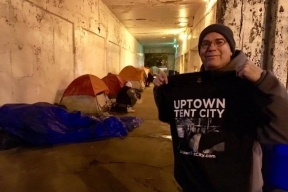 The most important thing I think to say about this victory –it was not a victory of the politicians, it was not a victory of the wealthy –it was a victory of the community of Uptown, who have been hounding Alderman [James] Cappleman, who have been hounding our mayor, and state officials, to demand that this shelter that is so urgently needed,” said Andy Thayer, Uptown Tent City Organizers and Gay Liberation Network.